Providing priority for public transport at signalized intersections is an excellent way to reduce public transport travel time and increase schedule reliability, helping to make public transport more attractive for customers and less expensive to operate. Passive Traffic Signal Priority – In these systems the traffic signals are set to turn green based on an average public transport vehicle speed. In other words there is no interaction between the public transport vehicle and traffic signal system; the signal timing is programmed to be more optimal for public transport speeds than private vehicle speeds. Passive priority is better than nothing, but, especially as technology becomes less expensive, active priority systems are a much better option. Active Traffic Signal Priority – In an active TSP system the bus or tram sends a signal to the traffic signal controller. The traffic signal controller (a computer), which is located in a box near the traffic signal or in a central headquarters, then decides how the traffic signal should react to the information. There are several different types of active TSP systems depending on the method the public transport vehicle uses to send the signal, the type of data sent by the vehicle, and the way in which the controller adjusts the traffic signal timing to provide priority. More detailed information is presented in the Best Practices wiki. The simplest traffic signal priority systems turn the signal green for public transport every time the vehicle approaches. In other words, these systems adjust the traffic signal ‘phasing’ when an approaching bus or tram sends a message to the traffic signal (a ‘phase’ is a combination of signal indications that are displayed simultaneously, e.g. red for eastbound and westbound, green for northbound and southbound = one phase). The action is not immediate, however, as the original phase must end before the signal turns green. For example, if a pedestrian signal is underway, enough time must be given for the pedestrian warning phase and to allow pedestrians to finish crossing the street. These systems are not very popular because they can cause fairly significant traffic congestion in areas with sophisticated traffic signal control systems designed to move traffic efficiently (we can discuss whether this is bad or not later, but it’s viewed as a problem for most traffic engineers and many others). To address the problem of traffic congestion caused by dedicated priority systems, another approach is to adjust the traffic signal ‘timing’ – the amount of time provided to the traffic signal ‘phase’ for the bus or tram. In these systems the timing is only adjusted when the bus or tram sends a message to the traffic signal controller saying that it would benefit from this added time. For example, say a bus is approaching a traffic signal that is green but about to turn yellow. The bus sends a message asking the traffic signal to stay green a little longer so that it can pass through the intersection without stopping. Similarly, if the bus is approaching the intersection and the traffic signal has been red for a long time, it can send a signal asking the traffic signal to turn green a little bit early. In this example note how traffic engineering and traffic signal design must work together: if the bus needs to stop to pick-up or drop-off passengers on the corner ahead of the traffic signal (near side) then it makes little sense to extend the green light when a bus approaches since the bus may need to stop anyway. It is critical for traffic engineers and public transport planners to work closely in the physical design of stops/facilities and traffic signal systems. Los Angeles has implemented this type of system on its rapid bus program. Their system is even more sophisticated than this description since it is linked to a computer that only gives the bus priority if the bus is running behind schedule. The goal is to keep the bus schedule reliable. The city of Sheffield (UK) has also deployed a TSP system that adjusts traffic signal timing to provide bus and tram priority at both coordinated and isolated traffic signal intersections across the city. This system works using an accurate public transport vehicle location system and adjusts traffic signal timing to provide priority for public transport vehicles that are delayed by more than two minutes. An innovative feature of Sheffield’s system is that it has been designed to provide ‘compensation’ for the traffic that is impacted by extending the traffic signal time for public transport (e.g. if the traffic signal timing is lengthened by 10-seconds in one phase for public transport, any phases that were delayed by the public transport extension are also extended by 10-seconds). Zurich developed a hybrid approach to traffic signal priority that combines timing and phasing changes into an integrated system. The approach was developed and implemented in the early 1980s and is a fundamental reason for the city’s high quality of public transport. 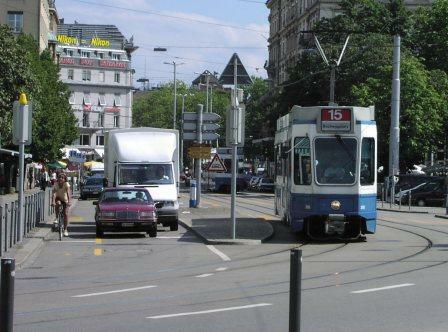 The Zurich system combines an automatic prediction of when buses and trams will arrive at a traffic signal with a flexible approach to traffic signal ‘phasing’ and ‘timing’. The automatic prediction system is straightforward: induction loops in the street sense when a bus or tram is passing over them and the travel time between the sensor and the intersection is known, thus the traffic signal receives warning that the tram or bus is, for example, 30-seconds away. Additional sensors communicate updated information to the traffic signal to optimize the signal setting process. After receiving the information on bus or tram arrival, the traffic signal controller determines what the best combination of ‘phases’ and ‘timing’ would be so that the public transport vehicle receives a green light exactly when it needs it. This means that green time is not wasted; in other words, either automobiles, pedestrians or public transport are always moving through the intersection. This is important because if nothing is moving, people or bikes might ‘walk against the light’ – a safety problem – and automobile drivers would complain that the traffic signal was red for no reason. The unique thing about the Zurich system is that it works with both ‘phasing’ and ‘timing’. In other words the ‘phasing’ of the traffic signal changes to provide a green light for public transport exactly when the public transport needs it. The change in ‘phasing’ is relatively unique: it means that the traffic signal pattern is not be consistent. This can be problematic when people are used to constantly repeating patterns and therefore must be introduced carefully. Intelligent Transport Systems (ITS) is a catch-all term that generally describes the application of technology to improve the operation of all types of transportation networks and services. Traffic signal control systems (including Transit Signal Priority) are a fundamental part of the ITS Toolkit. The combination of more powerful computing technology, pervasive mobile communications and increasing use of sensor technology in infrastructure means that there is a huge amount of research and innovation being done in the area of traffic signal systems. There are likely to be innovative new ideas for providing transit signal priority deployed in the coming years. We’ll try to keep this page updated with more information, but in the meantime feel free to use the comments to let us know about new ideas and approaches!